Lazio: The hope for water comes from Italy! With a document full of wishful thinking and fairy tales for the naive, the European Commission responded towards the very specific request of European citizens to adopt legislation that will incorporate in the European body of law the human right to water and sanitation for all citizens and who will also protect the resource from commercialization. 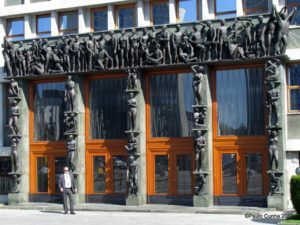 Well short of the circumstances and ignoring the institutions that they, themselves, have created when they tried to showcase an air of ” democracy ” in the European bureaucracy of Brussels , the Commissioners demonstrated which master they service and refused to take seriously the will of the European citizens. In fact, they chose to disregard the universal demand for protection of the human right to water by refusing to take legislative initiative. Their attitude is very indicative as to whose interests they protect. The excuses that they are already doing a lot towards this direction and that they are not pertinent and cannot oblige Member States to act are ridiculous. First, they accepted the text of the European Citizens’ Initiative right2water when filed. If they were not pertinent they could have said so then, in time before unions, organizations and movements across Europe lose time and money to run this lenghty and painstaking procedure. Secondly , if they are already doing a lot and theyagree then how is it possible not to make the step to legislate the human right to water and sanitation ? Thirdly , if they cannot oblige Member States for nothing then how come every now and then, through the European directives, they indicate what should be implemented by the Member States and those are running to harmonize their legislation with the requirements of a handful of “experts” ? Fourth, if they actually cannot oblige Memebr states since Article 345 of TFEU commits them to neutrality then how did they safeguard this neutrality as Troika members in 4042/2012 ( Memorandum of Cooperation between creditors and Greek government) which includes water services in the assets that the Greek state is to privatize ? Respect is not granted, it is rather claimed and conquered over time. When a participatory process is scorned procedurally and substantially, the next step is to live purely totalitarian situations. The momentum is extremely bad for the European Commission, that by refusing to give effect to the clear will of the people , blinks once again the eye to aquafed and private water operators. When institutional members do not respect the institutions they should not expect respect neither of their role nor of their person. Despite the disappointing announcement, even at last minute before the elections , the ( unelected ) Commissioners could, under pressure from politicians, rise to the occasion and to leave aside the “yes” rhetoric that in reality means “no” which underestimates the intelligence of the citizens. If they do act, we will be the first to congratulate them. The Commission today decided to react positively to the first ever successful European Citizens’ Initiative, in those areas where it is able to act. 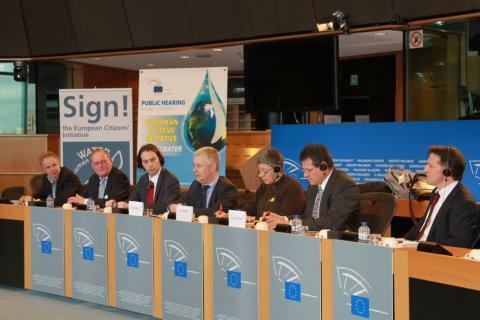 Organisers of the Right2Water ECI called on the Commission to ensure that all EU citizens enjoy the right to water and sanitation, to exclude water supply and management of water resources from internal market rules and liberalisation, and to increase its efforts to achieve universal access to water and sanitation around the world. The Commission’s reaction is set out in a Communication which starts by outlining the enormous amount of work already done by the EU in the field of water and sanitation. For example, within the EU, it has set ambitious water quality standards, and provided financial support to expand and improve water infrastructure in Member States. The decision on how best to operate water services is firmly in the hands of the public authorities in the Member States, and the Commission will continue to respect Treaty rules requiring the EU to remain neutral on national decisions governing ownership of water undertakings. Similarly, in international trade negotiations, the Commission will continue to ensure that national, regional and local choices on how to run water services are respected and safeguarded. The unique nature of water and sanitation services in satisfying the basic needs of the population have been consistently acknowledged in EU legislation. Water distribution and supply, as well as wastewater services, are already expressly excluded from the application of the cross-border freedom to provide services. And last year the Commission excluded provision of water services from the Directive on the awarding of concession contracts, as a direct result of public concerns. Globally, the EU and its Member States currently provide close to €1.5 billion/year for Water Supply, Sanitation and Hygiene (WASH) programmes in developing countries, making the Union the largest single donor in the world in this area. finally, invite the Member States, acting within their own competences, to take account of the concerns raised by citizens through this initiative and encourage them to step up their efforts to guarantee the provision of safe, clean and affordable water to all. (19 March 2014) The European Commission (EC) published a Communication today that gives its official response to the first successful European Citizens’ Initiative (ECI) which called on the EC “to implement the human right to water and sanitation in European law.” In the Communication, the European Commission does recall the importance of the human right to water and sanitation and states the importance of water as a public good and fundamental value and that “water is not a commercial product”. However, that’s as far as it goes. The ECI also asked for a legal commitment that there would be no EU initiatives to liberalise water and sanitation services. But there is nothing in the Communication on this. We certainly welcome the fact that the support of people for our ECI led to the exclusion of water and sanitation services from the concessions directive. However, the Commission’s Communication makes no commitment to explicitly exclude these services from trade negotiations such as the Transatlantic Trade and Investment Partnership (TTIP). Nevertheless, there are aspects of the European Commission response that we do consider to be positive. For example, the recognition that the provision of water services is generally the responsibility of local authorities which are closest to citizens. This confirms the trend towards remunicipalisation across Europe which according to the communication is the safest way for water to be kept out of the internal market rules, one of the main demands of the ECI. We also welcome the commitment of the Commission to promote universal access to water and sanitation in its development policies and to promote public-public partnerships. We expect that the review of the Water Framework Directive (WFD) and the Drinking Water Directive will be an opportunity to realise the human right to water and sanitation in the EU. The Citizens’ Committee expects to be considered as a major stakeholder. We will be asking the political parties and their candidates for President of the EC to commit to proposing legislation to implement the human right to water and sanitation and not to liberalise water and sanitation services in the EU and beyond. 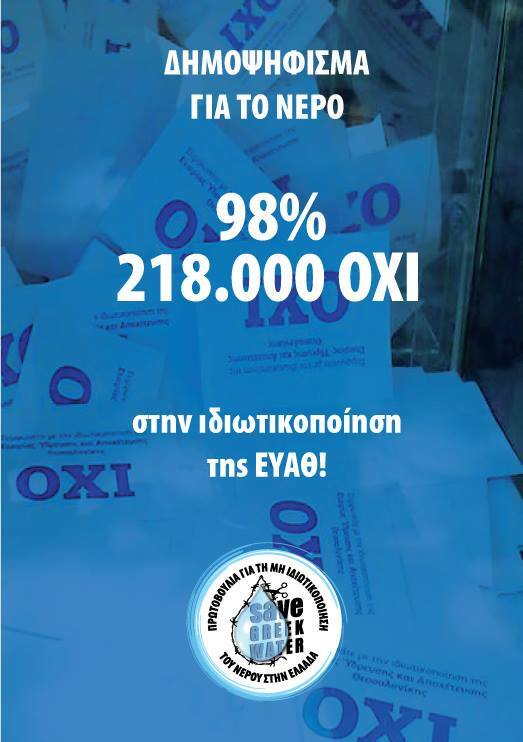 This will be important for the European elections in May 2014. Brussels – The European Commission (EC) made public today the communication on the European Citizen’s Initiative on the Right to Water. The communication fails to respond to 1,9 million citizens asking for a legislative provision excluding water and sanitation from “internal market rules” and liberalization. The EC’s reaction is lacking in real legislative proposals, and it boils down to a compilation of already ongoing actions plus the announcement of a public consultation on the drinking water directive whose outcomes will not be binding. While the Communication acknowledges the importance of the Human Right to Water and Sanitation and it confirms water as a public good, the EC fails to propose legislation that recognizes this right. The Commission also commits to promote universal access to water and sanitation in its development policies, including the promotion of public-public partnerships. Water and sanitation services were excluded from the concession directive thanks to public pressure, but the Commission has not committed in its Communication to explicitly exclude these services from the trade negotiations (such as the Transatlantic Trade and Investment Partnership – TTIP). The answer of the European Commission to the first European Citizen’s Initiative (ECI) to achieve the required support will not reassure European citizens who question the democratic legitimacy of the European institutions. The European Water Movement considers that overall the Communication does not address the actual demands to guarantee the Human Right to Water and Sanitation, and implies a bad precedent for the future of the ECI mechanism. Water privatization remains a very concrete menace in the EU. In countries like Greece and Portugal, the Troika is pushing for water privatization, and more and more citizens are being deprived of water access in municipalities where water supply is managed by private companies. In line with the signatures collected for the Initiative, citizens are fighting against water privatization across the EU, with many examples of massive mobilizations in Italy with the 2011 binding referendum, the local consultations in Madrid and Berlin, more recent mobilizations in El Puerto de Santa María (Spain) and upcoming local public consultations in Thesaloniki (Greece) or Alcazar de San Juan (Spain). Water should be a commons, not a commodity. 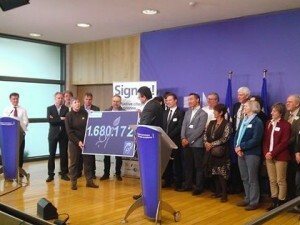 The European Citizen’s Initiative, that collected nearly 1,9 million signatures, expected the European Commission to propose legislation implementing the Human Right to Water and Sanitation as recognized by the United Nations, and to promote the provision of water and sanitation as essential public services for all. 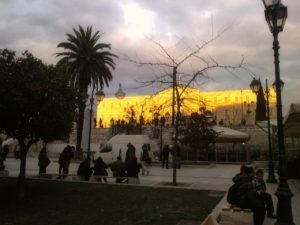 The European Water Movement will continue to support local struggles in places such as Thesaloniki or Alcazar de San Juan to ensure that water is declared a common good. And it will remind candidates in the elections for the European Parliament of the importance of recognizing that water is a human right, to concretely act towards its implementation and to avoid liberalization and commodification of water and sanitation services. The European Water Movement is an open, inclusive and pluralistic network of movements, social organizations, local committees and unions whose goal is to reinforce the recognition of water as a commons and as a fundamental universal right, an essential element for all living beings. We are part of the global water justice movement. We are united to fight against privatisation and commodification of this vital good, and to construct a public and communal management of water, founded on the democratic participation of citizens and of workers.